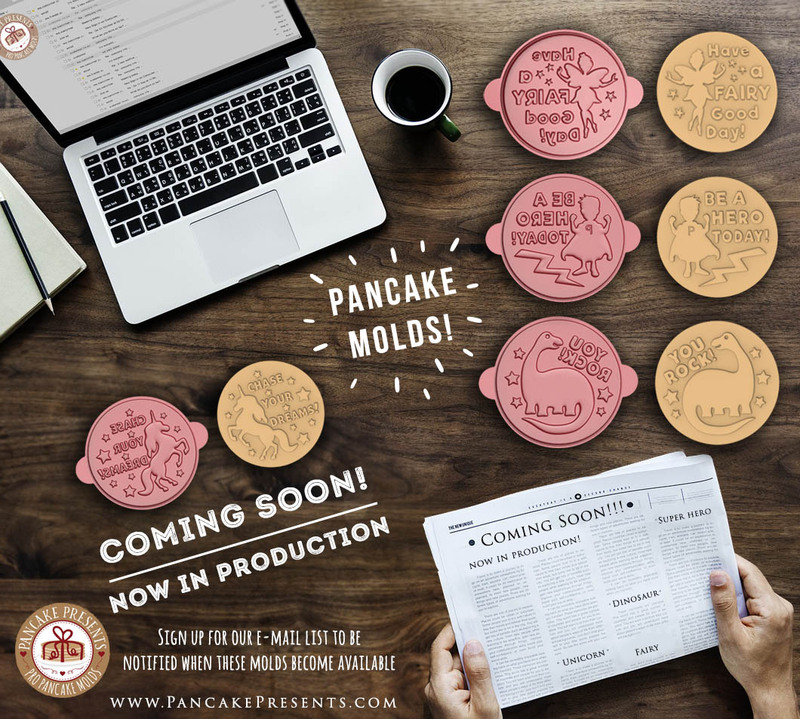 We are super excited to announce that our 4 new pancake molds are in production! You wanted more kid friendly molds and we listened! The four new molds are going to be a Unicorn, a Fairy, a Dinosaur, and a Super Hero! We tried to make these inspiring messages for kids to feel good about not only eating a yummy breakfast but also seeing fun characters and sentimental sayings! The Super Hero mold was conceptualized by my 8 year old son Isaac. He wanted a mold with a Super Hero that said “Be a Hero Today!”. We try to instill that any kind word or good deed can make you someones hero for a day! Even though she likes them both, my daughter Lilly is most looking forward to the Unicorn Pancake Mold. As parents and entrepreneurs, we are always telling our kids that they can do anything that they set their mind to. So the Unicorn Mold will say “Chase Your Dreams!”. The Fairy Mold is simply going to say “Have a Fairy Good Day!”, because who wouldn’t want to wake up to a greeting like that on your pancake! Last but certainly not least will be our Dinosaur mold that says “You Rock!”. This is the mold we most often get asked if we have, and SOON we WILL! I can’t wait to get my hand on these new molds and start making cute new decorative pancakes. Pink unicorn pancakes, I mean what sounds cooler than that! Make sure to like us on Facebook and follow us on Instagram and Pinterest for super cute pancake ideas! Stay tuned for our announcement of our new molds arrival!